Surgery remains the primary option for many men with localized prostate cancer. In radical prostatectomy, the entire prostate gland is removed as a unit with the seminal vesicles and portions of the vas deferens. This can be done via open operation, key-hole (using minimally invasive surgery), or key-hole with the help of a robot (robot assisted laparoscopic prostatectomy). Compared to other treatment methods such as radiotherapy, a radical prostatectomy has the advantage of providing accurate local staging as well as assessment of pelvic lymph nodes through a detailed pathologic analysis. For the right patients with prostate cancer pathologically confined to the prostate, the chance of cure with surgery alone at 10 years (undetectable PSA) is more than 90 percent. Professor Hamdy and Mr Leslie perform their radical prostatectomies using the robotically assisted laparoscopic approach. This technique allows the prostate gland to be removed through several small incisions in the patient’s abdomen. 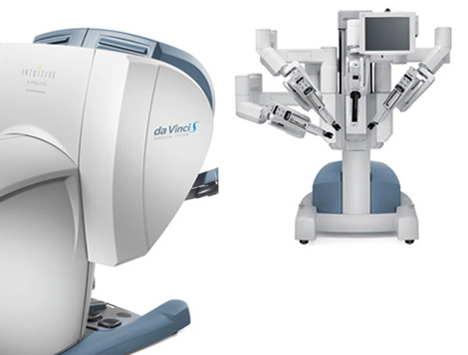 Robotic prostatectomy uses the da Vinci robot to remove the prostate gland through laparoscopic access in which surgeons make keyhole openings rather than a single 15-20cm midline incision.